I purchased the mattress for my granddaughters and they both love sleeping their beds. They say grandpa, "it is so soft and comfy." Delivery was quick and unpacking was very simple as all you do is open the box and the mattress expands. Good product! Experience a great night's sleep with our one of best products. This Sleeplanner 10" thick hybrid gel infused innerspring mattress is designed to support your spine carefully while you are sleeping. Its innovation reduces pressure points that cause back pain. Three layers of high density memory foam easily conform to your body shape and provide exceptional coziness. The Certipur-US certified Gel infused memory foam improves airflow and expels trapped heat to let you sleep longer, cooler and deeper. Moreover, the 7.5-inch height of tempered steel individually wrapped pocket coil springs relieve any pressure on your body through distribution of your body's weight evenly. It's not a pillow top mattress. But the cushion firm firmness lets sleepers have soft feel on the top layer and receive firm back support from innerspring layer. It's a inflatable mattress coming in a box please give it 48-72 hours to fully expand. To begin with, the mattress was delivered 4 days earlier than promised. Great, yes, but totally not prepared for that. It was easy to open the box by myself, but do follow the instructions! I had the rolled, sealed mattress on the bed platform before I began opening just the outer pouch and it started inflating the second it was out of the pouch. I had to race to get it out of the plastic bag and unfolded right side up in seconds before it expanded to its nearly full 10” thickness. (The pictures were taken just minutes after I unrolled the bed.) I let it be for 2 days, no smell, btw, before putting the mattress pad and sheets, etc. on it. Slept on it the third night. Very comfortable. I’d been been sleeping on an air mattress for 3 months, and that doesn’t conform to your body; you just displace the air with your body mass. 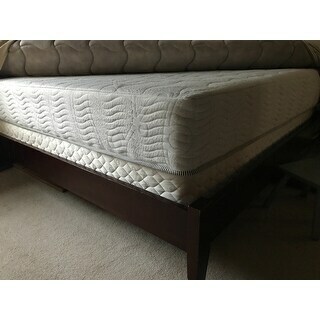 On this mattress I can feel my legs, back and hips all conforming at different depths in the mattress while still having the springs for support so I can move without having to swing my legs to sit up or get out of the bed. I had a queen pillow top before I moved three months ago, but I was always afraid that one day someone would find me dead having drowned in my mattress. I was tempted to buy one of those hospital support bars they hang over the patients bed so they can sit up by themselves to get out bed. It was so soft and the pillowtop was so dense that you’d sink into bed and it fill in around you like water. It was like being a turtle on it’s back. You’d be almost stuck and had to stuggle to get out of the bed. This is nothing like that, there’s firmness, but you sort of sink into the bed in all the right places. I don’t toss and turn as much as I used to, but it’s easy to turn onto my side when I do turn. It’s easy to sit up or get out of bed, and there’s enough side support with the sprinds that your not sliding to the floor like I would on the air mattress, or like the pillow top where you felt you’d needed another person’s help to move. And that Queen pillowtop, not even a national brand, was over $800.00 back in 2010. This mattress was a lot more affordable for a guy on a disability pension. Arrived within 1-2 days. Packed in a box that was approx 2’x2’x4’ Take the mattress out of the box, cut the white wrap off, cut the clear wrap off. The mattress inflated immediately, it looked like a completely full mattress within seconds. In my opinion, a person could sleep on this mattress right away, though the instructions say that the mattress continues to inflate for 72 hours. Mattress is not too soft; not too hard. Just right. No chemical smell. This was a one person job. Thanks! Ok so for he price of this mattress I thought how could it be great?? But I looked over some reviews and thought if the mattress was no good, I would not be out too much money. What a surprise!!! The mattress has a cooling affect because of the hybrid material which is great because my husband is a hot sleeper. Also I was concerned because it had springs in it that when my husband moved during the night I would feel the movement. And bounce around on the mattress like the last mattress we had. To my surprise there was minimal movement when your partner moves around. And my has been is not complained about being overly hot at night. It was amazing with how fast the mattress unfolded once we took it out of the package. All in all I am very impressed and I would definitely recommend this mattress!! Very pleased with my purchase! The bed fully expanded within a couple of hours. Provides the much need comfort and support for my neck and back injuries. Have purchase many memory foam and gel mattress that claim to provide what i needed, to be so disappointed. Quality is exceptionally well designed. It is exactlly what i was looking for. Could not beat the excellent price any where else. This mattress is a gift for myself on my birthday. I like to sleep on it. Mattress is a great quality and very comfortable. It’s soft, but not too soft, which give a good support! This is the perfect mattress for my guest room. I love the gel memory foam combination to keep things cool and that it has some innerspring colls is just great. I tried it out the other night and I just love the firmness of this mattress. This mattress would be great for a guest bedroom but is not substantial enough to withstand every day use. I have been buying 14" memory foam mattresses for my bed. Before replacing the last one, I decided to read up on what thickness I really needed. All of the literature recommended a 10" mattress if you are under 250 pounds, which I am. So, I downsized. The mattress is comfortable enough but not plush. I do not sink into it the way I did when I had 14' mattresses. The mattress does not seem sturdy or like it will withstand the test of time. Because it is comfortable enough, I would recommend it for a guest bedroom, but not a bedroom in which it will be used daily. The mattress arrived one week earlier than estimated. I was amazed at how quickly the packing was able to be removed...and more surprised that while peeling away the final plastic covering, the mattress began to expand! All of this took less than 15 minutes to accomplish - not bad for a 77-year-old! Within an hour, the mattress appeared to be fully expanded. As advised, I waited until two days later to actually test its comfort level - what a pleasant feeling! It's hybrid construction adjusts quickly and responds very comfortably to twists and turns, side and back rest positions. I would highly recommend this product. Wow! I was skeptical of buying a mattress online since I hadn't tried it. Or one in a box. But this mattress is so comfortable and stays cooler during the night instead of some which hold in heat. It was fun to open the plastic and watch the mattress puff back to life. This is saving my back and I am so thankful. Full memory foam is uncomfortable to me but this is a perfect mix of spring and foam suppport. Very comfy and worth every penny. Anyone who’s stayed in the guest room wants to know the brand and cost so they can purchase one for themselves. Super Comfortable, expanded nicely. Like the Hybrid, my son loves his new bed. Other two kids have the straight memory foam and i feel that this is the most comfortable bed in the house. Springs stick out the side is when you sit on edge, that was my only problem with it. I bought just the mattress for a platform bed. It worked well for a few weeks then started sinking into the slates. So my personal recommendation would be that it definitely needs a box spring if it’s being used on a platform bed. I'm sleeping like a baby; what else can be said! 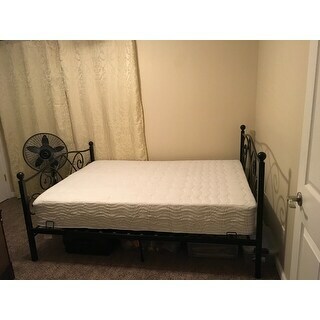 I needed a new bed after having my previous for a few years and honestly didn’t know what route to take being on a budget. I came to overstock since I’ve heard so many good things about it and i browsed throw plenty of mattresses before i decided on this one. It came in a box plus plastic. When i opened it it immediately inflated and it did have a slight smell. The smell was barable and didn’t last anymore than 24 hours. It took about 2 hours for it to completely inflate. It is very comfortable and i was happy with my purchase. I bought this for a guest bedroom and we are very happy with it, very comfortable and a reasonable price instead of buying an expensive mattress. Our guests loved it! Very nice mattress. Bought it for guest bedroom. Very comfortable and well priced. Easy set up and very comfortable. Couldn't have been happier with the comfort of this mattress. So happy, we're buying another. I haven't had a hybrid mattress. I work a labor intensive job, and participate in mixed martial arts. This sleeplanner by far has provided some of the best sleep I've had in awhile. Has me awakening rejuvenated, and relieved for my next day. This mattress is very comfortable. It comes rolled up and vacuum sealed. It is thick and soft. I would recommend this to anyone. It is a great price and extremely awesome to sleep in. This mattress was a easy set up and really comfortable. This is used in our guest room and my daughter loves it when she comes to visit.I will by this mattress again. Great price for a good quality mattress. Comfy mattress that fits nicely in my new Murphy Bed. "When used with a platform bed with wood slats, is it advised that the platform bed has a minimum slat distance? For instance, I am aware that certain mattress manufacturers will void their warranty if the mattress is placed on a platform bed with less than 3-inch spacing between the slats." "Will it hurt to leave mattress in packaging for seven days?" Ideally, the mattress should be removed from its packaging in the first 72 hours of receiving the product. If held longer, you may have to allow the mattress to expand in a longer period of time. "What is the weight capacity for this mattress?" The mattress is not rated with a maximum weight capacity. "What is the coil count and coil gauge for this mattress? Also the sum of the mattress construction is off; by summing the material, it's a 10.75" mattress. Not a 10" mattress. Can you please verify that the mattress construction is: Micro-Fiber Quilted Fabric Cover 0.5" + Dura I-Gel Memory Foam 0.75" + Duraflex HD Foam 2" + Dura Coil Spring 7.5"?" The spring count is 690. The coil is 2.0 mm in thickness. The top and bottom quilting 0.75 inches thick. The I Gel layer is 0.75 inches. The HD foam layer is 1.5 inches. The spring base is 7.5 inches high. "What is the coil count for this mattress?" The spring count is 690. "do you need a box spring with this mattress?" It really depends on the bed you are going to be using. The mattress can be used without a box spring. "How long is the mattress sale?"